What is MRI Residential Management? 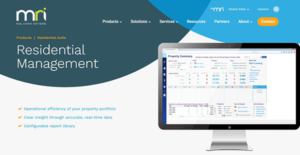 MRI Residential Management is an innovative property management software for multi-family managers. It’s a comprehensive solution that automates and streamlines processes to allow property managers to focus on resident retention and leasing instead of the tedious, paper-based processes. The platform offers the best-of-breed, end-to-end functionality that empowers users to manage everything right from leasing to scheduling, renewals, and more. MRI Residential leverages powerful technology and a well-connected ecosystem to boost operational efficiency. Its groundbreaking approach to residential property management delivers limitless flexibility without reducing control or adding complexity. The application helps businesses tackle the global residential market to increase efficiencies, grow income, and build occupancy with ease. Some of the key features include accounting management, property management, MRI Go, portfolio performance management, Flexibility toolkit, MRI information exchange, MRI application exchange, Reporting & analytics. MRI Residential Management is a powerful property management software for Condos, HOAs, and Co-OPs management. The platform exhibits impressive capabilities that meet your unique needs and help you amplify your management competencies. It features role-based dashboards that offer increased visibility into every facet of the property that matters most to you. The program facilitates scalable and automated processes in a bid to help you focus on leasing. Its secure, revolutionary architecture scales with your business offering an all-inclusive set of features to support every operation. The online leasing suite allows your prospects to see all unoccupied amenities and units. Better still, it permits the prospects to apply for units/amenities, take a preliminary screening test, and make the initial deposit. MRI Residential offers a similar portal that allows residents to make online payments. In addition, it automates renewals, thereby allowing you to boost residents’ retention. MRI Residential management offers a reliable accounting module that simplifies payments management. The module utilizes real-time data to expedite the management of day-to-day accounting functions including reporting, billing, facility management, and project management. Additionally, you can easily manage your portfolio performance. The platform delivers clear visibility into the current financial status thus enabling you to manage the entire resident lifecycle and compare against projections effectively. The MRI Go feature provides an excellent global search capability that enables you to navigate the portfolio data and take prompt action on daily tasks. If you are considering MRI Residential Management it might also be sensible to investigate other subcategories of Best Property Management Software listed in our database of B2B software reviews. Since each enterprise has unique business requirements, it is prudent for them to refrain from looking for a one-size-fits-all faultless software system. Needless to say, it would be pointless to try to find such a system even among widely used software solutions. The smart thing to do would be to list the various essential aspects that need consideration such as main features, budget, skill levels of staff members, company size etc. Then, you should do your homework thoroughly. Read some MRI Residential Management reviews and investigate each of the other solutions in your shortlist in detail. Such comprehensive homework can make sure you weed out ill-fitting platforms and select the app that provides all the elements you require for business success. How Much Does MRI Residential Management Cost? We realize that when you make a decision to buy Property Management Software it’s important not only to see how experts evaluate it in their reviews, but also to find out if the real people and companies that buy it are actually satisfied with the product. That’s why we’ve created our behavior-based Customer Satisfaction Algorithm™ that gathers customer reviews, comments and MRI Residential Management reviews across a wide range of social media sites. The data is then presented in an easy to digest form showing how many people had positive and negative experience with MRI Residential Management. With that information at hand you should be equipped to make an informed buying decision that you won’t regret. What are MRI Residential Management pricing details? What integrations are available for MRI Residential Management?